This is a bit embarrassing, but I still post it here... so you others don't have to admit you didn't know this... of course you knew... everyone knew... except for me. In iTunes select your iPad, then click on the "Photos" tab and select a folder there. 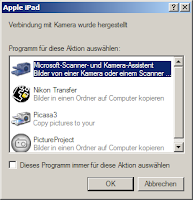 This will then (everytime you sync) copy all the images from this folder on the PC to your iPad. One thing that bugged me about my iOS devices is that everytime I hook them up to my PC, Windows prompts me to select an action or application for this device... Quite annoyed me because... hey... you're supposed to connect to iTunes... duuh. 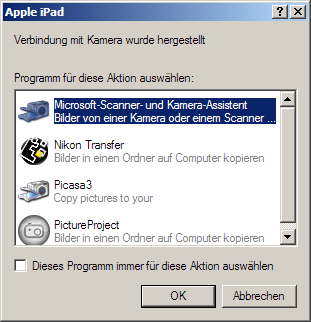 So iOS devices register themselves to your PC as a camera as well. Still I thought: How stupid, my iPad does not have a camera. And neither does my iPod touch. Well, in some weird way it is a digtial camera: from a Windows / interface perspective the iPad is a device that creates and (more importantly) stores images. Just like a digital camera. So images you create on your iPad (e.g. as a screen shot, or email attachment, ...) can easily be sync'd to your PC through this interface then. Windows (or the program of your choice) will do the transfer for you. So, this is how you sync photos from your iPad to your PC... but of course, everyone knew that.